While the dance-floor sound of big bands like those of Benny Goodman and Chick Webb was rapidly becoming the standard for swing music, there was still a great deal of flexibility in the form. The following selections show some of the interesting variety that one could find in jazz in 1938, featuring everything from Gypsy strings to 1920s-style small group jazz. Here is another amazing record from Europe’s top jazz band, featuring the incomparable Django Reinhardt on guitar and Stéphane Grappelli on violin. Songs played in a minor key tend to generate dramatic tension – an increased sense of seriousness or somberness. This one, played in the A-minor harmonic key, is no different, but rather than creating an uneasy mood, the band channels that tension into a feeling of exotic uncertainty. The talented musicians keep things upbeat and swinging even while they leave the listener wondering what’s next. From the opening bars, the record plays with our expectations. 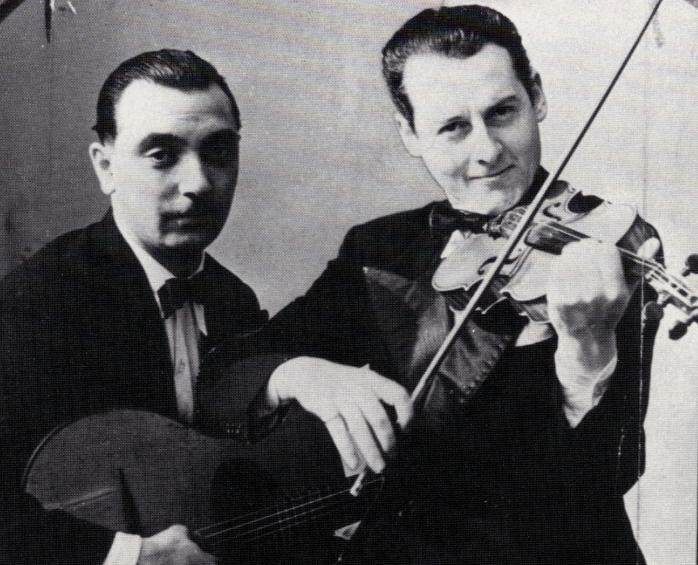 Grappelli plays a brief intro that is followed by a single note from the bass that seems to be going somewhere, but instead simply fades to nothing. Where we would expect the full band to enter, we instead find ourselves back at the beginning. Grappelli repeats his intro and then we are finally off and running. In the tradition of New Orleans funeral processions, Armstrong recorded this gospel song set to jazz. It proved immensely popular and has been covered so often that today it is the first song that comes to most listeners’ minds when they think of New Orleans jazz. Like much of Louis Armstrong’s 1930s output, “When the Saints Go Marching In” is more a showcase for his butter-on-burnt-toast vocals that for his trumpet playing, but he does end the song with a rousing solo that reminds us of his talent on that instrument. The other solos are taken by J.C. Higginbotham on trombone (twice) and Charlie Holmes on alto sax, and they have a distinctly Dixieland feel, as opposed to the swinging big band tone of the rest of the record. The lyrics are very simple, but Armstrong’s distinct voice is enjoyable to listen to, as are his spoken asides (“Blow, brother Holmes!”) and the backup singers’ responses (“Marching in!”). This is joyous music, plain and simple. It may not be deep, but it is perfect for singing along. 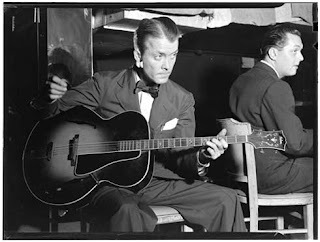 Although the swing era was already in full swing, Condon didn’t forget the older style of jazz he had played in the ‘20s in Chicago, and blended elements of it into swing to create his own unique sound. “Ja-Da” begins with some slow, old-style polyphony, with Bobby Hackett’s cornet carrying the lazy main melody while George Brunies and Pee Wee Russell add countermelodies on trombone and clarinet, respectively. Jess Stacy’s piano punctuates this and the rest of the song with spare, percussive notes that create a delicious contrast to the otherwise languid pace. After the opening section, Bud Freeman takes a long, mellow solo on tenor sax then Hackett returns to do the same on cornet. Mid-way through his solo, the accompaniment drops away and Hackett’s playing becomes much more forceful and staccato for a few bars before sliding back into mellow, dreamy territory. A brief solo by Russell on clarinet and a moment of soaring polyphony by the entire band bring the song to a close. This was the closest ting to Louis Armstrong’s groundbreaking Hot Five and Hot Seven sessions being made in 1938. At this time, all the money from those recordings at Amazon go to record company people (the artists are dead). Most of these tracks are beyond the limit for copyright, are they not? Why not just offer them up? (if I'm wrong, please don't jump on me, people, just explain it to me, calmly, rationally... I'll get it). Copyright law is a complicated thing. Here in the U.S., before January 1, 1978, copyright laws were largely determined by individual states, and the laws giverning them continue to be complex for recordings issued before that date. I encourage people to explore old music and obtain it legally for free when possible. There are many places on the Internet where one can get these old recordings. I have listed some in my "Links" section (and will list more as soon as I can get around to it).